Despite many families still being unable to dig out from the storm, we still had an impressive attendance of 25 players for this month’s K-8 Scholastic Championships. It was a pleasure to see so many new faces! 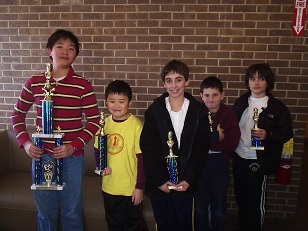 In one of our strongest K-8 sections yet, Grant Wang won all four of his games to take first place! Another impressive performance was put in by Brandon Wang who took 2nd. In the K-5, the CCFC's Dream Team members finished well, taking places 1 - 5! Despite very tough opposition, the Sapers siblings and Devin Shah had solid performances as well. In what became a familiar pattern for this tournament, Dream Team member Eddie Xue won the K-2 section with a perfect 4-0 score! 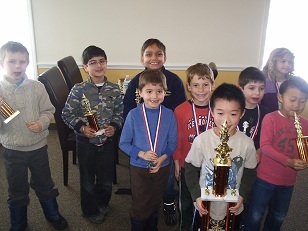 Aalok Bhattacharya and Nathaniel Moor tied for second place with 3/4. Both players lost only one game to Xue. Cooper Lee playing in one of his first ever tournaments also had an impressive tournament, finishing 4th out of 10. 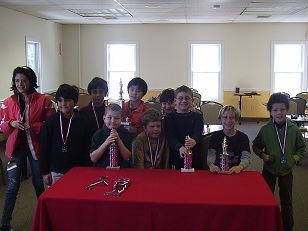 Be sure to join us next Monday, February 18th for our President’s Day Scholastic tournament!